An observant reader would notice another four letter word, but hey, it's literature! What we're really here for is the wine! If You See Kay is a Cabernet Sauvignon-based red wine blend out of Lazio, Italy. It also contains Petit Verdot and Primitivo (Zinfandel). And quite frankly, I LOVE THE LABEL. I think the artwork is fantastic. Easily one of my favorite wine labels. Edgy, bold, and attention-grabbing. The controversy around this wine is, of course, surrounding the name. Some people are prudes. Last time I checked, we were all adults (us drinkers, I mean) and a simple pun, and a classic one from literature no less, is really not that big of deal. But from a marketing standpoint, it served its purpose. Attention is attention and those who were upset about this wine actually just drew more attention to it. Silly people. Anyway, the 2010 If You See Kay red wine pours a devilishly dark, deep blood red that verges on becoming black. Smelling brings a pleasant but subtle blend of black raspberry, blackberry, and mocha. 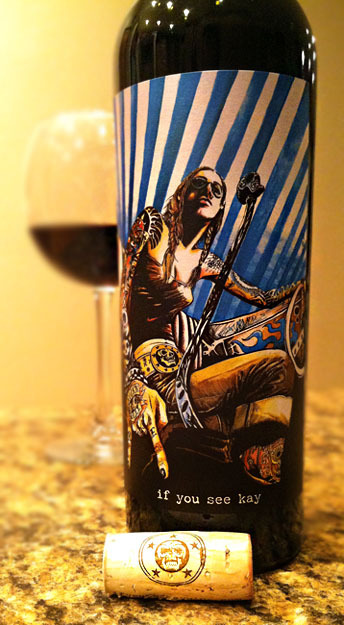 Take and sip and she hits you with a bold and sensual combination of dry raspberries, juicy blackberry jam, plums, zesty cocoa nibs, and a bit of spice and rock 'n roll attitude with moderate tannins and a pleasing acidity. Quite honestly, this wine is freaking delicious. Deep, dark, and definitely well balanced with enough bold attitude to make me want to drink it sip after sip after sip. Not to mention that I love the label artwork which makes all those plain beige labels seem so, well... plain. If You See Kay is worth every penny of the $20 retail price. Drink This: if you want a delicious, dark red wine with a bit of attitude. Don't Drink This: if you're a prude who can't get past the name of this wine. and I have a lot of 100pt. wines in my cellar collection. Was jut given this as a gift. Quite excited to try it out! I had no idea what it was, and had to read the label a few times before I got the pun haha. $20 a bottle? I prefer my wine be a Malbec, in vintage cardboard, that much for 3 liters, thank you very much.